What Do Real Railroads Do? 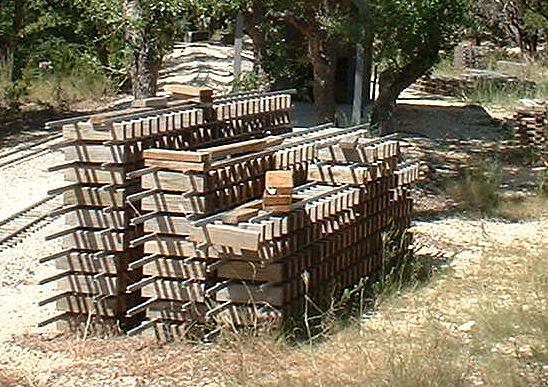 Although there are other sizes, a typical railroad tie is 8+1/2 feet long, 9 inches wide, and 7 inches thick. Tie spacing can vary, but Boston & Maine's rule of thumb was 3000 ties per mile. That's a tie spacing of about 21 inches. The gap would be 12 inches. Now let's translate to 1/8th scale. You do NOT need to follow these numbers at all. But let's use them for guidance. Longer ties can carry more load due to increased ground contact area. They tend to make a more stable track as they have more leverage. If we scale a prototype tie to 1/8th scale, we get 12.75". But if you cut up an 8 foot two-by-four into 12.75" pieces, you get 7 lengths, but end up with a good chunk of wood left over. So now let's divide 8 feet by 7 lengths, allowing for the saw cut you get 13.625" (or 13+5/8"). It's longer than 12.75", but longer is better. Use what you have. If you are using two-by-fours ripped in half, that's about 1.625" (or 1+5/8"). Use that. It exceeds the prototype scaled dimension of 1.125" (or 1+1/8"), but that's OK. You can also use the thickness of the common two-by-four for tie width. That gives you 1.5" (or 1+1/2"), which is closer. But if you are using stringers, you need to be careful about matching tie height, as it will be the cut dimension. The last time I went to the building supply store, I bought white pine to use on the Baskin Cutoff. I noticed that 8-foot two-by-fours were $2.69 each, most likely due to the Florida hurricanes that year. I also noticed that the 8-foot two-by-six lumber was $3.69. I would get 14 ties from a 2x4 and 21 ties from a 2x6. So $2.69/14 is about 19 cents per tie, and $3.69/21 is about 17.5 cents per tie. It does require more ripping, so it's not for free. (2 cuts for 21 ties vs 2 cuts for 28) So what do you think I bought? Tie width is also slightly different when you use two-by-sixes. At 5.5" minus 2 saw kerfs at about 0.1", that's 5.3"/3, or 1.767 inches. (about 1+3/4") So Baskin Cutoff ties are a little wider. Here is your chance to really benefit from my mistakes. 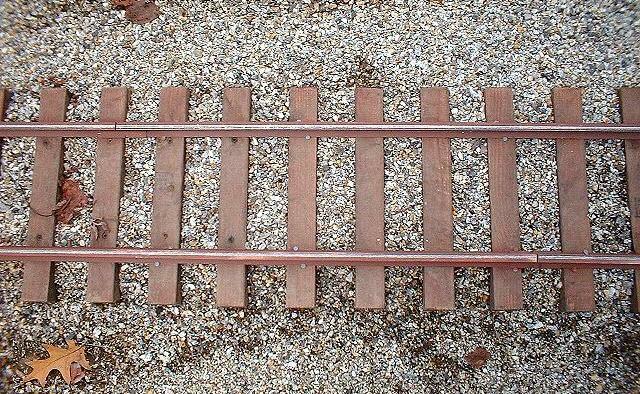 When I started laying track, I decided to use a tie width of 1+5/8" and a tie gap of 1+5/8". (This is a spacing of 3+1/2" minus the saw's kerf.) I used these dimensions because 1+5/8" is approximately what you get when you rip a piece of "two-by-four" in half, and it made sense at the time to make the gap equal to the tie width. My entire main line is 3.5" spacing as pictured above. This requires 28 ties per 8 foot panel. It is tough to get the railroad pick between these ties. My cutoff spur uses 4.05" spacing, as shown above. Not only does this require less wood, 24 ties per 8 foot panel, but I can get my tools between them. Most visitors don't even notice the difference until I point it out to them. Can you get by with even less ties? Yes you can! This parameter is not critical. Anywhere from 3/4" and up is fine. Beware that thinner ties will be more prone to warping. For this reason, I use 1.5" thick ties, the thickness of a typical "two-by-four". Can ties be TOO tall? This group was also having problems with the ties moving with the rail during expansion. That was most obvious at the rail gaps. And since the rail gaps were staggered, the ties would visibly skew at the joint. The extra height has no advantages (other than to save sawing). And if you have any soil movement at all, the tie now has more leverage against the rail/fastener connection. 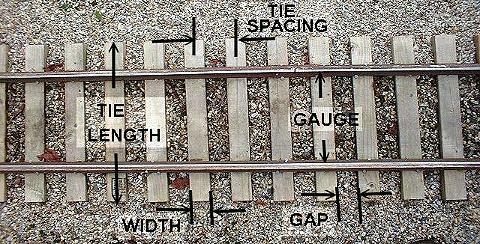 Also consider how much extra ballast is required to fill these ties, ballast that is not supporting anything. 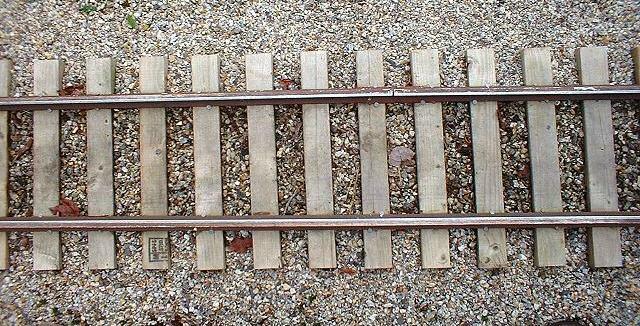 If they used stringers instead of double height ties, they would have used less wood and ballast and would have a stabler, smoother track without the drift problem. By the way, this was a fine team of hobbyists with an excellent track. I have a variety of tie treatments used on my railroad. Unless otherwise noted, white pine is the most often used base material here. These are treatments I have used. As you can see, I have quite a few experiments running concurrently. My track is only 2 years old, so so far, no problems with aging are seen. I started using this EPA blessed dock and post treatment on cheap lumber. Most of it washed off and now the untreated white pine is all that's left. The lumber was cheaper than CCA, But by the time one factors in the cost of the treatment, plus the time, there was no benefit to using it. So I started using CCA. It was a little pricier than the untreated, but I didn't have to buy or mess with copper napthanate. Then the local retailer was closing out their stocks of CCA, so I was bringing home double loads of this stuff. There are some safety issues with it. Then the new deck lumber came out. It was considerably more costly than anything else below plastic. At $3.69 each, it was no bargain. I did extensive research and some independant tests of it's effect on aluminum rail and found it not to be a problem. It will discolor fasteners. So three switches and part of the yard is ACQ. The safety issues with this material are no improvement over CCA. Even the Hemlock was cheaper than ACQ. Back at $2.69 - ugh. But the local retailer was out of ACQ. So down went the Canadian Hemlock ties. This variety of evergreen has one notable problem -- shake. So toss the ties that have any evidence of shake. Also, there are no natural preservative qualities to this material, so the bugs will bring their knives and forks. The yard tracks are mostly Hemlock. The height of frustration has been reached. I have gone back to hand dipping ties, this time in Behr deck stain. So choose a color you like and stick with it. The Baskin Cutoff is almost entirely deck stained. Evidently a silicate based process that is fairly new, relatively inexpensive, and supposedly totally non-toxic. Definately worth looking into for any new construction. Definately worth keeping an eye on. Currently neither cheap to purchase nor ship. I bought a small piece of plastic deck lumber to use as a facing under my barn doors. That one piece was 7 dollars. Inexpensive, but very heavy. Do not underestimate the number of trips to the local retailer that will be required because of your vehicle's loading limits. Also consider the amount of labor involved in building and filling forms to make the ties. And, by the way, do not exceed your vehicle's limits whether hauling cement lumber, rail, or even -- trains. Get some of those fencing panels you see at the local building supply store. They come in a few sizes. Cut them up into 13" widths. One panel will give you enough ties to complete a small railroad. Yes, you can cut them up into loadable pieces right there in the store parking lot. Hold off on the bonfire until you get home though. You will inevitably have pieces left over you can't use. I recommend reading it if you are in a wet climate.